Unless otherwise stated, in this Chapter we will make the following assumptions. For sake of simplicity we will consider galaxies with purely circular, concentric isophotes. More complex and more realistic shapes will be introduced later. Thus, the only coordinate is the radius , in units of seconds of arc [how do you translate this angular into linear units?]. Note that any galaxy can be circularized by building circular models where, at the same surface brightness level, the isophotes in the real object and in the galaxy have the same area. 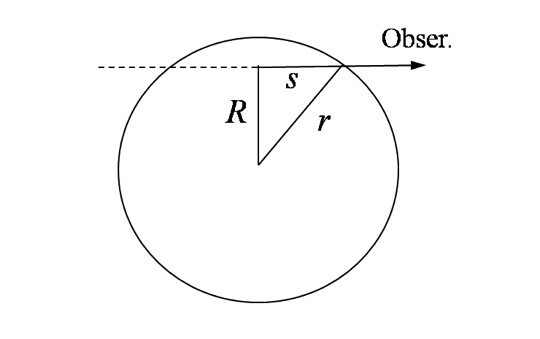 This is simply done by measuring the area of an isophote of the real galaxy from where the radius of the corresponding circular isophote in the model is computed as: . 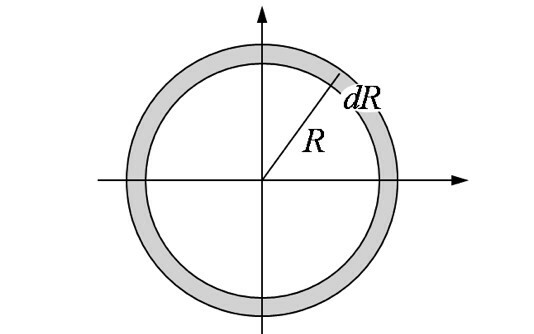 The star added to the symbol for the radius serves to remember that this quantity is relative to the circular model, that is that it is an “equivalent” radius. We shall first comment on the data reduction. We will then present the empirical formulae developed to represent the light profiles of early-type galaxies, then those for spiral disks. The rest of the lecture is devoted to present some parameters used nowadays in studies of very large sample of galaxies. The tremendous developments of observational equipment has produced, since the last few decades of 1900, extraordinary data-bases with millions of galaxies which must be treated and analyzed by automatic tools and statistical methods. This flow of data has been a genuine revolution in a field where, no more than 30 years ago, a paper would deal usually with no more than a few tens of galaxies at the time. 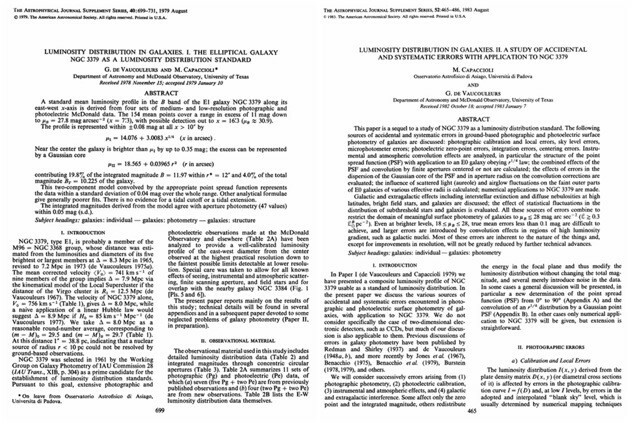 Two papers with the photometric techniques and the results of a study of the standard E galaxy NGC 3379. Credit: The Astrophysical Journal. 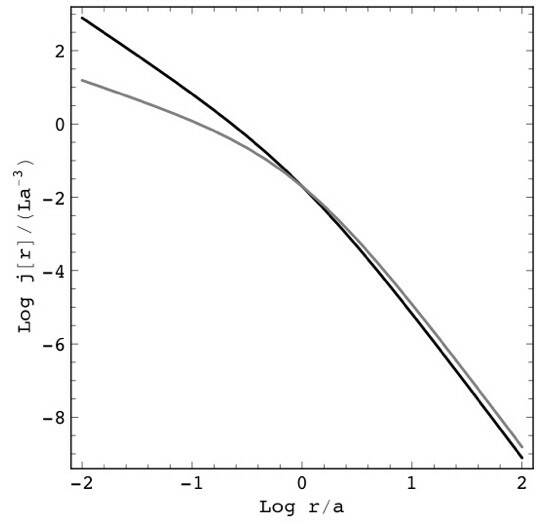 Log of the relative intensity in Reynolds-Hubble light profile as a function of the relative distance from the center. As we can see, it diverges as increases. This does not mean, though, that tends to infinity with , since the radius cannot grow indefinitely, as we have said in listing our assumptions. Same as above, for the surface brightness, to be calibrated with a value for c, versus the log of the relative radius. Again there are no free parameters, since and are scale parameters. Outwards it continues to run as . 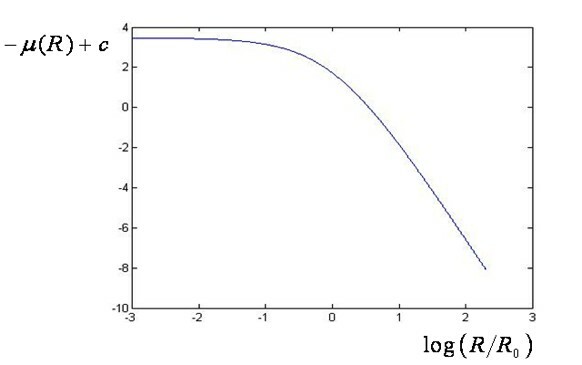 Log of the relative intensity in Baum light profile. Same as above, for the surface brightness. while for the surface brightness vanishes: . For one gets the standard Reynolds-Hubble formula. 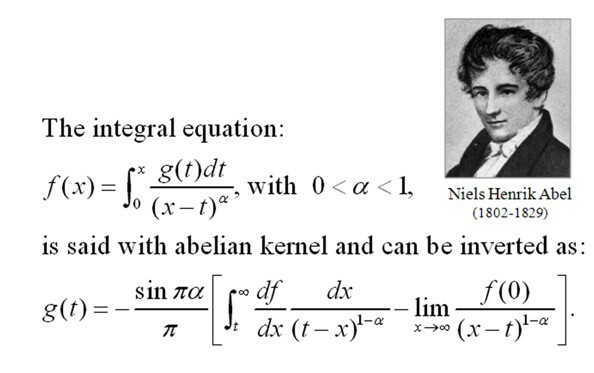 Oemler formula for various values of the tidal radius. It has two scale factors, and , and, as we shall see, no free parameters. In fact, can be fixed by properly choosing the scales for and . To this end, let us define an “effective radius” as the isophote radius that encircling half of the total light of the galaxy. We can do this since, as it will be clear later, a de Vaucouleurs model has a finite luminosity, and since we are considering circular (circularized) galaxies only. Remember that, when dealing with real galaxies with elongated or irregular isophotes, the effective radius of the circular model just introduced would be written as to remind us that it is not only effective but also equivalent. G. de Vaucouleurs, Annales d'Astrophysique, 11, 247, 1948.
is the effective surface brightness, ~3.33 times fainter than the peak brightness. The circular differential element in the integral over the sky of the surface brightness profile. Left: the R1/4 profile of NGC 3379. 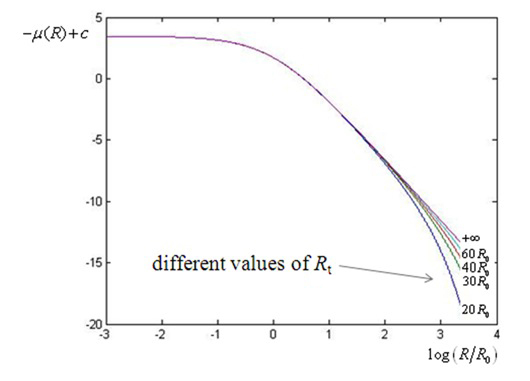 The (O-C) residuals (right-top) show the presence of a nuclear component in excess of the R1/4 law. Assume that you have obtained the light profile of a (circular) galaxy by sampling the surface brightness at a set of radial distances from the center of the object. How do you verify whether the profile follows a de Vaucouleurs law and, in any case, how do you determine the values of the scale parameters? The answer to the first question is simple. You check if the surface brightness data versus (no matter if not zero-point calibrated yet) define a straight line. You then extrapolate the best-fitting linear profile to [how do you do the best fit? ], so to find and . The abscissa of is . 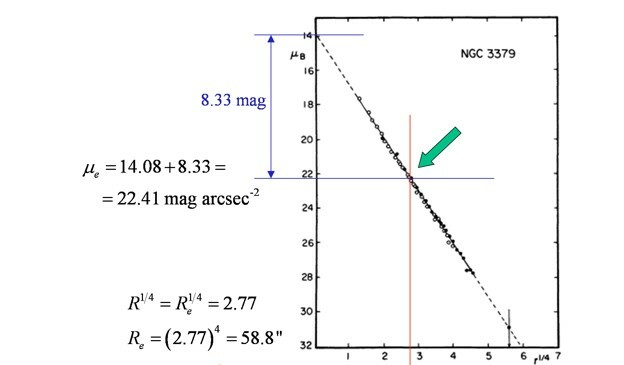 The photometric profile of the normal E NGC 3379, plotted in the de Vaucouleurs plane, is well fitted by the straight line. Its extrapolation to zero gives the starting point to derive the scale parameters. The idea came to him from the fact that with just one parametric formula he was able to represent the trends of the light profiles of ellipticals and spiral disks , as we shall see soon. So, Sersic speculated that the parameter , now called Sersic parameter after his name, could typically assume any value between 1 and 4. According to Occam’s principle: “entia non sunt moltiplicanda praeter necessitatem“; that is, never add a parameter without a very good reason [explain the validity of this statement by thinking at polynomial fittings of observational data]. At Sersic’s time there were no reasons to accept his formula. The reason was found 25 years later by Caon et al. (see next two pages), who discovered a correlation between the size, or the luminosity, of a galaxy (early types and spiral bulges) and the value of the Sersic parameter given by the best fit of its luminosity profile with the Sersic formula. 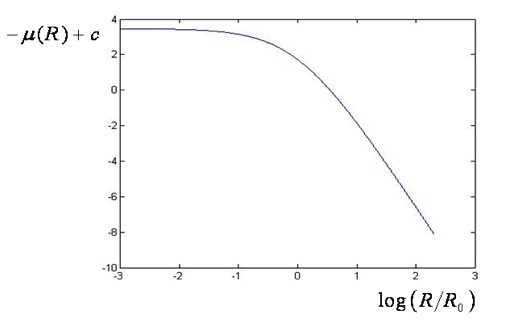 The trend of the Sersic formula for some values of the Sersic parameter n.
Same as above, for a logarithmic abscissa. 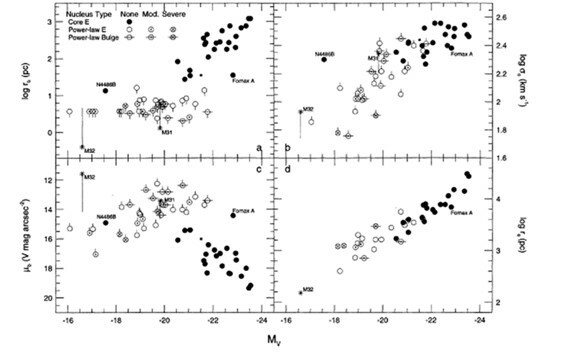 Discovery paper of the correlation between Sersic parameter and the size/luminosity of galaxies. Credit: MNRAS. Continuation from the previous page. Credit: MNRAS. , named core radius, is a scale factor, while the so-called tidal radius is a free parameter; the smaller it is, the steeper is the surface brightness decay in the outer envelope. Note that, but for , the profiles are truncated. Note also that, for very large tidal radii, the inner profile mimics the behavior of seeing convolution [see lecture no. 23 about seeing]: the inner profile is in excess of the inward extrapolation of the outer trend. 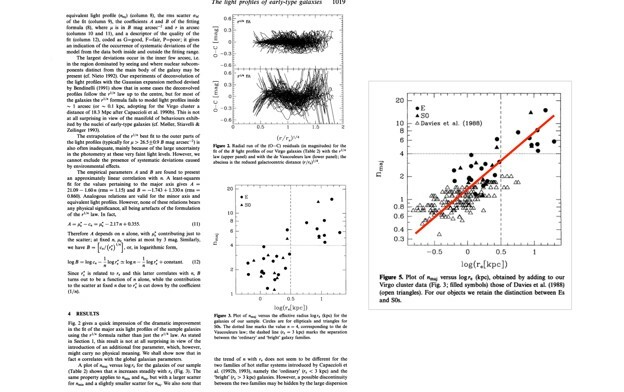 The King law for the light profiles of spheroidal galaxies. Let us now derive the space density of light, j(r), from the project light profile, I(R), in the case of a spherically symmetric, transparent galaxy. Geometry of the integration along the line of sight, under spherical symmetry assumption. Asymptotically, i.e. for , it is: and . 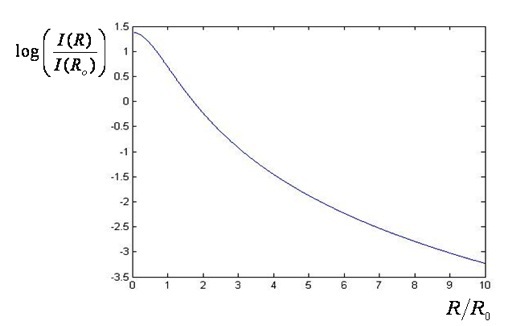 As a general rule, if at large radii the light density decreases as a power law with exponent , also the surface brightness profile does, with an exponent . 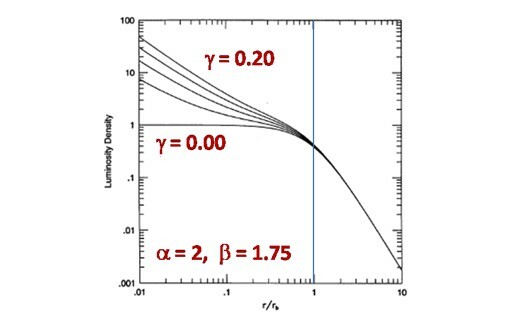 In dynamical modeling it is much more convenient to use the space density profile rather than the projected light distribution. For this purpose quite a few formulae have been proposed. where is the total luminosity and is a characteristic length. gives the Jaffe (1983) formula. 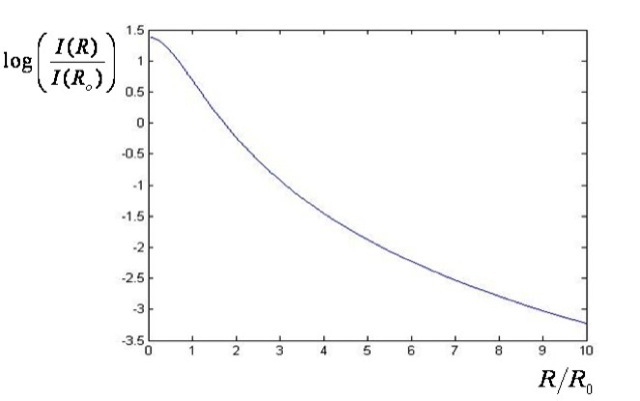 The Hernquit formula (black) and the Jaffe formula (gray). Density is in units of L/a3, radius is in unit of the scale a.
controls the smoothness of the transition between the cuspy core and the outer profile. 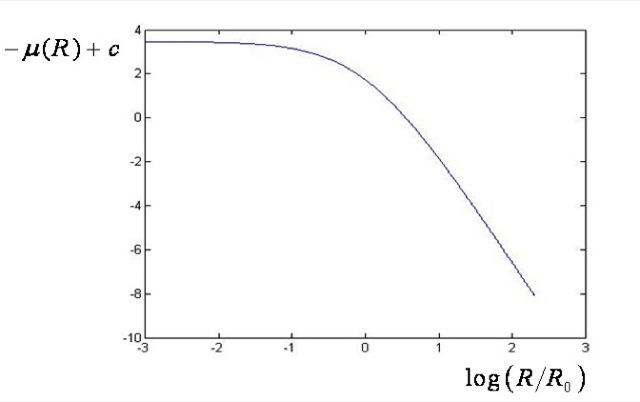 The Nuker formula fails convergence into a finite total luminosity for . 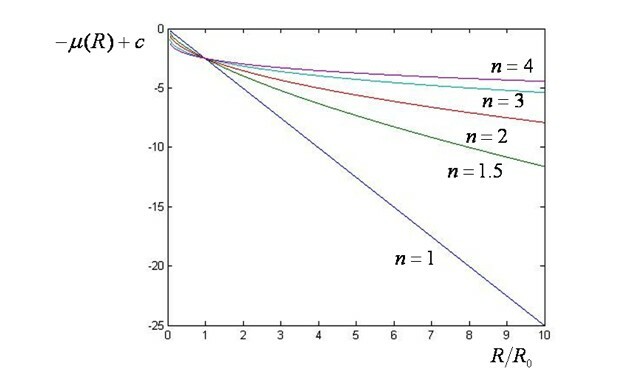 Various trends of the Nuker formula for various values of the free parameter ?. they rise steeply toward the center in midsize Es The excess light may come from nuclear starburst resulting from “wet mergers” (that is with gas). Nuker formula fits to two different light profiles: the core galaxy NGC 1399 and the power law galaxy NGC 596. Correlation of the Nuker formula parameters and of the central velocity dispersion with the total magnitude of ETs and bulges of S0-Sb. HST data (Faber et al., Ap.J., 114, 1771, 1999). 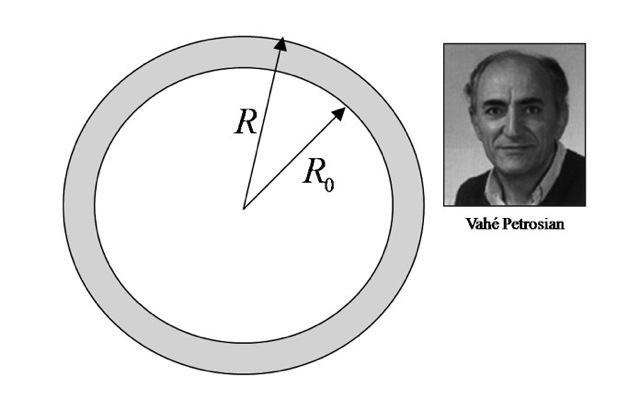 If we assign a value to the ratio and to a constant , the Petrosian radius is the value of at which . For instance, for the SDSS: , and . Why the Petrosian radius is so popular in modern galaxy surveys? The reason is that does not depend on the photometric scale parameter of the light profile: i.e. it is the same for two galaxies differing only for the mean surface brightness, while it depends on the shape of the light profile. Note that for , for . On average early-type galaxies are red: the rest-frame (B-V) color ranges from 0.8 to 0.9. The color is due to a population of aged stars (young stars have already completed their cycle). The color gradients are negative, more and more as the mean color reddens (a trend which is weaker in dense environments, e.g. rich clusters). In true ellipticals the gradient slowly flattens up with increasing total luminosity. Why it is so, it is still matter of debate since several concurring causes are in play: plain stellar evolution, metallicity gradients, merging (but when?) and (consequent) AGN activity. Bulges are bluer than E galaxies (even at the same luminosity), indicating that they are younger and or more metal poor than ellipticals. Most bulges do not reach solar metallicity. Bulges also show negative color gradients (bluer outwards). Rest-frame colors of ellipticals change with redshift (distance) intrinsically (evolution). This property, as well as the new classification of galaxies based on SDSS and GALEX data, which is driven by the color versus luminosity (mass) diagram (the red and blue sequences) will be examined later. 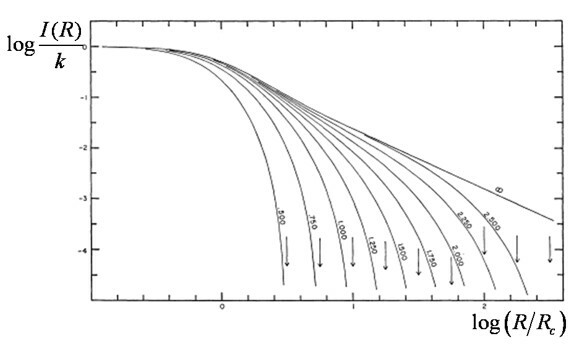 Colors vs. Hubble types from Roberts and Haynes (Ann.Rev.A.A., 32, 115, 1994). Red lines mark the range of early-types (E-S0a). M. Capaccioli, "The de Vaucouleurs and the r1/4 law", 1989, article in The de Vaucouleurs: a Life for Astronomy, M. Capaccioli and H.G. Corwin Jr. (eds. ), Adv. Series in Astrophysics and Cosmology, Vol. 4, World Scient. Press: Singapore, p. 173. 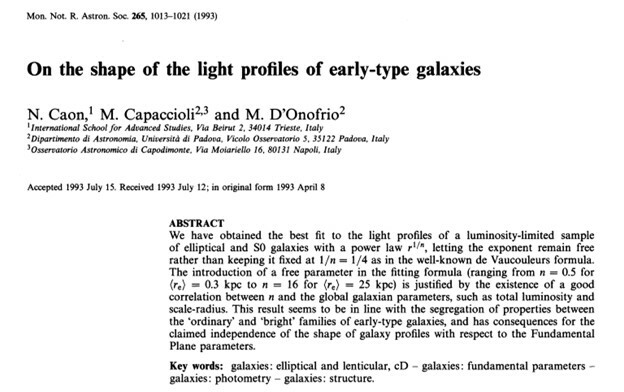 M. Capaccioli and G. de Vaucouleurs and , "Luminosity distribution in galaxies. II. 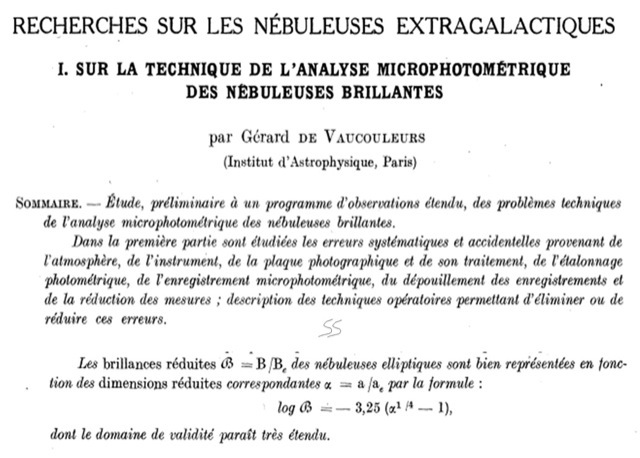 A study of accidental and systematic errors with applications to NGC 3389", 1983, Ap.J.Supp., 52, 465 (with G.de Vaucouleurs). 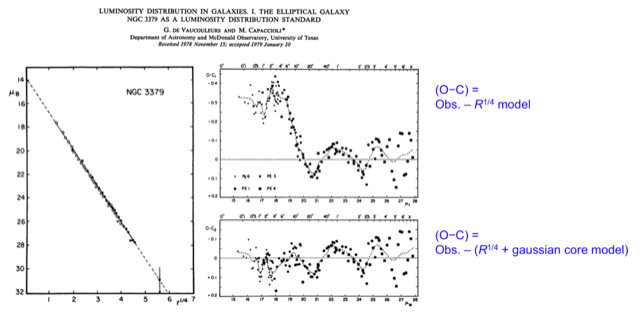 M. Capaccioli, "Photometric properties of galaxies", 1989, Second Extragalactic Astronomy Regional Meeting (Cordoba, Argentina), Academia de Ciencias: Cordoba, 317. G. de Vaucouleurs and M. Capaccioli, "Luminosity distribution in galaxies. I. 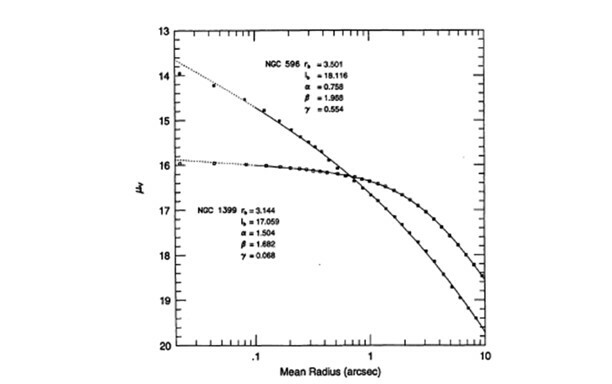 The elliptical galaxy NGC 3379 as a luminosity distribution standard", 1979, Ap.J.Supp., 40, 699 (with G.de Vaucouleurs).